Hi, this is probably not paranormal but thought it was interesting and wanted to share anyway, I took some pics of running water in a pan for an experiment with my son, when we were looking at the photos I immediately saw a large older man’s face on the left side of the pic. My son saw it and took my husband a few minutes but he saw it. I posted on Facebook and most people saw the face, a few did t see anything and one person saw a cats face by the top. I had to resize the photo but other then that no editing was done. Wow I didn’t see the child’s face, can see it in thumbnail better then when enlarged! Edited by tannilisa, 09 December 2018 - 03:06 AM. I see a sprite like creature in the bottom left corner when I click on the thumbnail, but not a Childs face!! Some people do this as a form of ITC. Taking photos/videos of a pan of water (or a TV screen on a feedback loop) to look for faces. I've seen some ok results from the TV method, and used to investigate with someone who did the pan of water thing. Personally, I believe it's like looking for faces/animals/etc in the clouds. 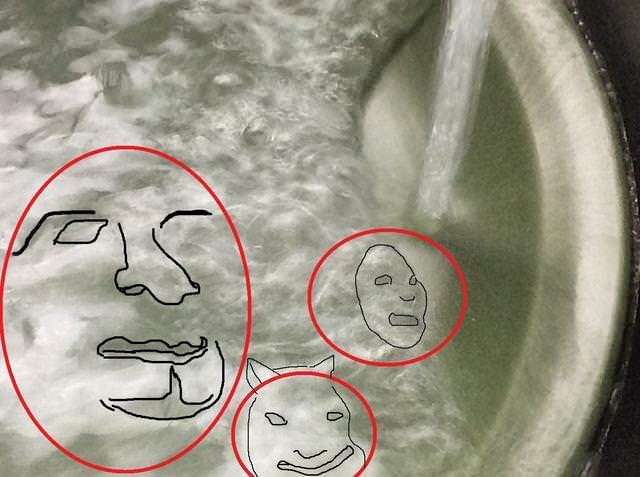 I was originally doing this for an experiment with my son, didn’t even think about seeing faces in the water...It does remind me of clouds and all the faces, creatures and shapes that can be seen. OOGH! With the new format, I can't figure out how to search the archive! Can anyone tell me? After a while I could see part of Santa Clause's face and some cats eyes and face outline to the left and above Santa. I like the Yuletide theme. Just shift Santa so I can search. EDIT: You already did, thanks. Edited by SpukiKitty, 14 December 2018 - 07:22 PM. Edited by MacCionoadha BeanSidhe, 16 December 2018 - 11:14 AM. thanks for the outlines I see them all now! I see more, every time I look at the picture. So many eyes looking up down and out! Wow, I always found stuff like this interesting. I think there's a book about something like this. I'll look it up. Cause I remember seeing something like this off of Amazon. Edited by WhispersInTheAttic, 10 January 2019 - 08:31 PM. Wow, that is interesting, although I didn't look at the book I did watch a few of his related video clips. Wow I didn’t notice the other faces you outlined...the big face you outlined is the first thing I saw.